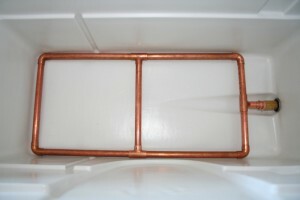 Only brew day picture and of my mash tun manifold???? Home brewing is always more fun when a friend or three is around to share the experience, talk about brewing, and, most importantly, share a few home brews. Steve was in for the entire day as he wants to learn how to home brew. His wife purchased him a brew kit a while back and he wanted to experience a brew day before taking to the task himself. Rich made it over for a couple of hours to share a few home brews. Finally, Chuck meandered over towards the end of the day. He reminded me how his system doesn’t need to be stirred by hand while chilling, which is my least favorite task of the brewing day. I started brewing much later than normal as Steve couldn’t make it over in the morning. Since this beer was scheduled for a 90 minute mash and boil, I knew this was going to be a long afternoon/early evening. The process went by quickly as the down time was filled with conversation. I overshot my mash water temperature (since I was conversing) so I had to mix the mash for ten minutes to bring the temperature down to 148 degrees. The only other issue was final volume of wort being about 5.1 gallons and a gravity of 1.058. This is caused by a subpar burner which I don’t have much control over, burns dirty leaving soot on the burner and pot, and is just an overall pitfall of my system. Chilling (stirring) took about 25 minutes with Steve helping out to give a sore arm rest. The yeast was pitched with the wort at 69 degrees. The plan is to raise the temperature up to about 82 degrees (give or take) to help finish the fermentation process. Saccharification Rest @ 148*F for 90 minutes. The next home brewing session will be a batch of Honey Pot Pale Ale as my wife has been requesting for quite some time. Enjoy! 2012-03-04 – Gravity at 1.002 after a fermentation in which I hit highs of 85 degrees Fahrenheit. Yeast was a beast. Placed in the basement which is about 55F. 2012-07-14 – Finally tasted and reviewed. Useless Fact: A flea can jump 200 times the length of its own body. This is equivalent to a person jumping almost a quarter of a mile. I changed the recipe of the original Backspin Belgian Pale Ale and used Wyeast 5112 Brettanomyces bruxellensis for this brew day. I brewed the beer only because I had this planned and the yeast starter (more to come) started the week before as I had a bad cold. I am hoping that I didn’t contaminate the beer with my disease ridden breath. For the first time since I started brewing all grain I had my grain crushed by a different grain mill. The crush was much finer than I am used to. 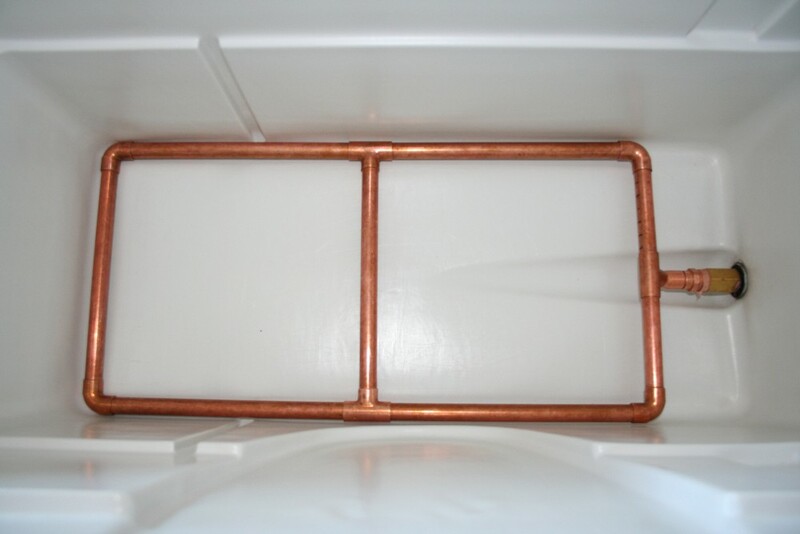 The mash tun manifold had no problem with my original gravity benefiting to the tune of almost 80% efficiency. I will continue using the same grain mill for the next few batches to determine if this will be the typical efficiency to expect from the mill. The yeast starter I made the Sunday before I brewed. The starter was ready by Thursday, three days ahead of time, so I sat on it. Surprisingly it took off quickly, percolating quite nicely the next morning, 12 hours after pitching the starter. Mash 154*F for 60 minutes. Outside of being sick, as I mentioned above, the brew day went well. I was very satisfied with the efficiency gained from the new mill crush (I usually double milled the grain with the other mill I was using). Now the hard part will be the wait until I hit my final gravity. Enjoy! 2013-02-22: Last bottle turned out to be better than any other. Really nice beer. Useless Fact: The bumblebee does not die when it stings—it can sting again and again. In bumblebee hives, the entire colony, except for the queen, dies at the end of each summer. Each year an entirely new colony of bees must be produced. I can’t believe it has already been four weeks since I brewed Caddy Tan Brown Ale and a week since I dry hopped the beer (actually nine days). I did a small tweak to the dry hopping this time around. I placed the hop pellets in a sanitized hop bag (the same that could be used in the boil to limit hop trub) and then into the carboy. In the past I have always thrown in the pellets, racked on top, and had a swell time racking into the bottling bucket. This was an attempt to limit the amount of hop trub that made it past my layman’s filtering capabilities (a strainer). Good and bad news from this experiment. Bad first: the aroma of the beer wasn’t as expected from the hops. It wasn’t off, it just wasn’t as strong as anticipated and at the level I have come to expect. Upon finishing up, taking the “hop bag” out of the carboy, I squeezed out a ton of aroma. If I continue to use this method I will probably slosh the carboy around periodically during dry hopping to make more use of the aroma. I just don’t know if that will cause any issues. Any input would be appreciated. Good: the beer came out very clean with almost no hop trub even coming out of the carboy let alone making into the beer. Of course I sneak a sample. At first I was a little leery but reread BJCP on the style and I don’t think it is that far off. I do believe the bitterness might be high as well as the roast aroma. I will be back with an update in several weeks after a taste test. Enjoy! Useless Fact: The leaf-cutter ant sometimes makes anthills 16 feet deep and an acre wide. My first official American craft beer from Nebraska: Dark Side Vanilla Porter by Empyrean Brewing Company. This has been down in the cellar for a few months and comes by means of my transactional buddy on the west coast, Jordan. Dark Side Vanilla Porter made my mouth salivate for vanilla; one of my favorite flavors/aromas in an American craft beer. Alas, I couldn’t find any trace of vanilla in Dark Side, which was a bit of a let down. The aroma and flavor were both on the muted end of the spectrum, making me think of this as a “light porter”. Roasted malt is the forerunner characteristic of the beer with coffee and smoke coming in the taste but that’s where it ends. The body is helped out by an ample carbonation that can’t hide the light body, but this does make for an easy drinking porter. A very sessionable porter that is average for the style: nothing takes it up a notch but, overall, nothing is wrong with it either. Enjoy! Useless Fact: The animal with the largest brain in proportion to its body size is the ant. Brew day. I look forward to each one, increasingly so lately. The five hours spent home brewing takes my mind off everything else, focusing my minds eye on the process at hand. Backspin Belgian Pale Ale is my first attempt at any type of Belgian style beer. Putting together the recipe took me to many websites, a few magazines, and a book or two. I noticed that the style is all over the place but that Belgian Pilsner malt was the base grain for the style. Yes, some use 2-row or others but 90% or more stayed along the Belgian Pils route. Recipes ranged from one specialty grain to as many as five. Typical suspects were Munich, Vienna, CaraMunich, CaraVienne, Biscuit, Aromatic, and even some sort of straight sugar. Some of the American centric ones used Caramel/Crystal malts as well. Hops included such types as Willamette, Goldings (U.S., East Kent, and Styrian), Saaz, Perle, and Fuggle. This gathering of information aided in formulating a recipe. I shared the recipe with Michael Tonsmeire, who continues to be a huge help while putting up with my constant barrage of questions, and Dave, the guy that works at the local Brew & Grow. Mike mentioned that he thought my recipe was going to be too sweet, Dave backed it up and let me taste a Belgian Pale Ale he brewed with only eight ounces of CaraMunich for a five gallon batch: too sweet is right. From those constructive critiques, there was one issue that I thought about the rest of the day: I had already mixed the grains, had them in my car, and was going to mill them on my way home from work, how was I to adjust my grain bill? 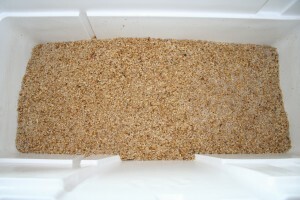 Throw out the grains and start over? That’s a waste. 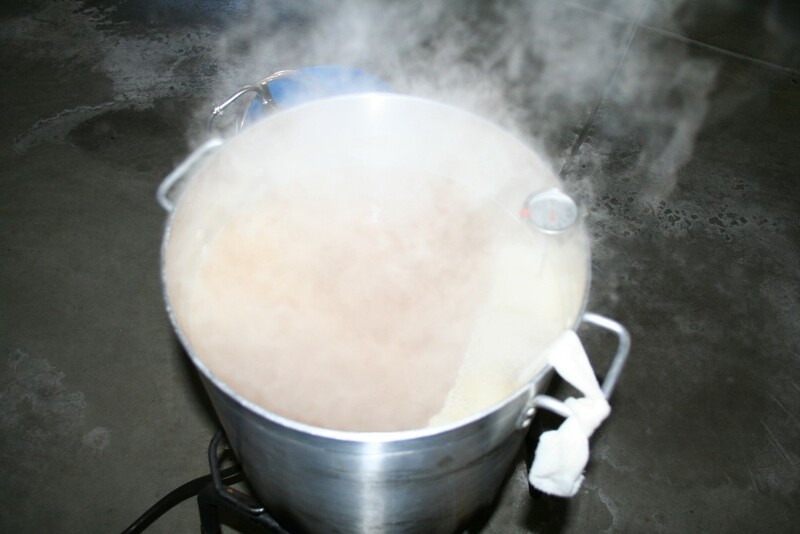 Mike gave me several ideas, including using a low mash temperature to allow for the beer to finish dry. A counteractive measure to the large amount of sweet malts. I mixed that idea with the fact that I knew I placed all the specially grain in the bottle of the bucket. 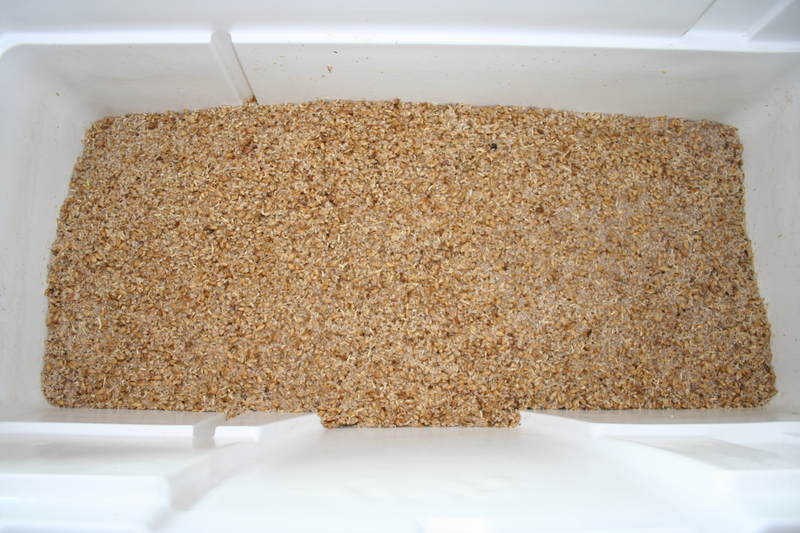 I carefully pulled the base malt and a bit of the specially malts from the bucket into the grain mill, added an extra pound of Belgian Pils, and placed the excess sweetness to the side. What does this mean? Two things: first, I have no recipe to share as I am embarrassed of my original. Second, I have no idea what the final recipe was after pulling off some of the original grains. I have ideas, that will help me make the recipe so I can do the next one on all Brett. Overall the recipe formulation was much worse than the brew day, which went off without a hitch. I did mash at 148 degrees for 90 minutes with a 60 minute boil. 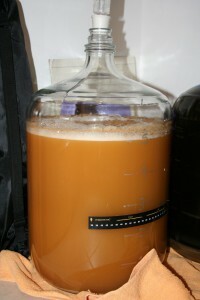 A yeast starter of 2L was made using WLP500 Trappist ale yeast. 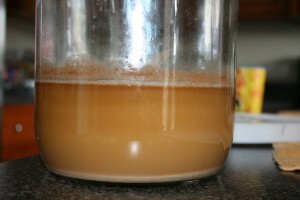 I pitched the yeast around 3:30pm and it was going great the next morning. Fermentation has the temperature around 63 degrees because it is in the basement. After three days I will bring it upstairs and let it rise to ambient temperature of 67 degrees which is where it will sit until it is time to bottle. Mike helped here with the fermentation schedule. I don’t have high expectations for this beer, especially since I don’t know the final grain bill, but I feel like I did my best to pull something good out of it. More to come after bottling. Enjoy! 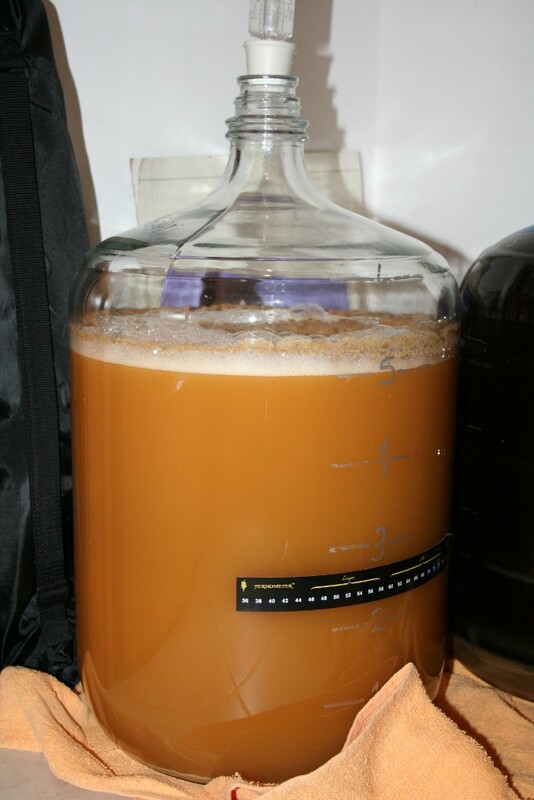 2012-02-07: Brought the busy fermenting beer up from the basement, where it was holding at 62 degrees. Approximately 52 hours after pitching the yeast (pitched on 2012-02-05 around 3:30pm). 2012-02-08: Temperature up to 65 degrees with three bubbles or so every two seconds. I am hoping this will aid the yeast in finishing fermentation. Useless Fact: There are 5 million different species of insects in the world. The insect population of the world is at least 1,000,000,000,000,000,000. The weight of the world’s insect population exceeds that of man by a factor of twelve. In order to keep up with my 2012 New Years Resolutions I have to keep on home brewing as I have to brew at least once every three weeks. I have two brews already under my belt so I am slightly ahead of the forecast but I am sure something unexpected will come up to slow me down, especially over the summer months; better ahead than behind. I have my next three home brews laid out. This weekend will be a Belgian Pale Ale, the following weekend will be the same Belgian Pale Ale but 100% fermented on Brettanomyces, and finally a Saison. In term of the second round of the Belgian pale, I plan on using Brettanomyces bruxellensis and I might, and stress might, also include some Brettanomyces claussenii. This mainly depends on the amount of time I have to make the starter. I have been talking to Michael Tonsmeire about my options, since he knows a ton about wild yeast and bacteria and, the best part, he is very giving of his time. If I want to use the claussenii strain, it is only available from White Labs year round but there cell count is much less than Wyeast for Brettanomyces cause me to have to make a double starter rather than a single. He also mentioned that a starter of Brett needs a week, obviously a double starter would need two weeks and I am just over a week out, so the bruxellensis seems to be the strain I will use. No matter what yeast or yeasts I use, I am sure that all the beers will turn out. I have to just nail down the recipe I want to use for the Saison. Enjoy! Useless Fact: An ant can lift 50 times its own weight. A bee can handle 300 times its own weight, which is equivalent to a human being pulling a 10 ton trailer. I recently mentioned the tug-o-war that is going on in American craft beer at the end of the line: people buying the beer. This time around it is time for a bit on the retailers. It might not be a perfect assessment of the situation but at least it is my perceived notion. Larger retailers (chains) getting clout over the one-off mom-and-pop shops. There is a chain in my area that gets every release but there are many releases that they corner the market. I have heard from someone that used to work there that they actually put pressure on the distributor, because they move so much product, to only sell certain short releases to them. This kills the fair market. This chain is usually higher on beer prices than other beer stores; strike one. This cornering of the market creates an unfair advantage for the store as customers will look to them for not only the rare beer but start using them for more of their needs; strike two. 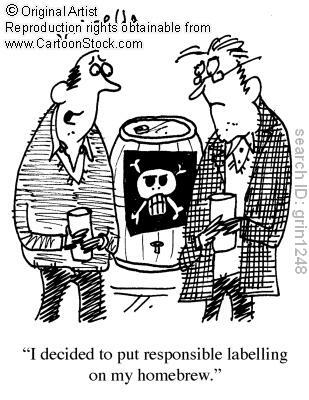 Usually the head beer guy at the store will promise people the beer, they won’t even put it on the shelves, limiting those who have exposure to the beer; strike three. Don’t be niave to think that similar activities aren’t happening in your own area. I stay away from this liquor chain at all costs. I am too the point that certain releases are ridiculously difficult to get to begin with so why bother. Price gouging is a shorter but sicker story. This practice centers on short releases, of course, and the price jumped up $5, $10, or more over the normal retail price. I think this is more in smaller shops (they aren’t saints either) as they are more aware of the happenings on the gray market of reselling beers for ridiculous amount. It is awesome how it is all related. I don’t know what is worse, the retailer raising prices and/or people paying the prices. Both of these point are troubling to me. I like the small stores as they are more customer oriented rather than bottom line. They get to know you and you know the people will be there for a long time. There will be more goofiness coming, I just hope it doesn’t drive me to drink. Enjoy! Useless Fact: A grasshopper can leap over obstacles 500 times its own height. In relation to its size it has the greatest jumping ability of all creatures. You are currently browsing the Sips blog archives for February, 2012.